Louis-Fabrice Latour's yields are down in 2016, but the maison's top wines are concentrated and focused. From micro to macro, I headed from a 2016 Burgundy preview with Philippe Pacalet to Maison Louis Latour, one of the three largest houses in Burgundy. 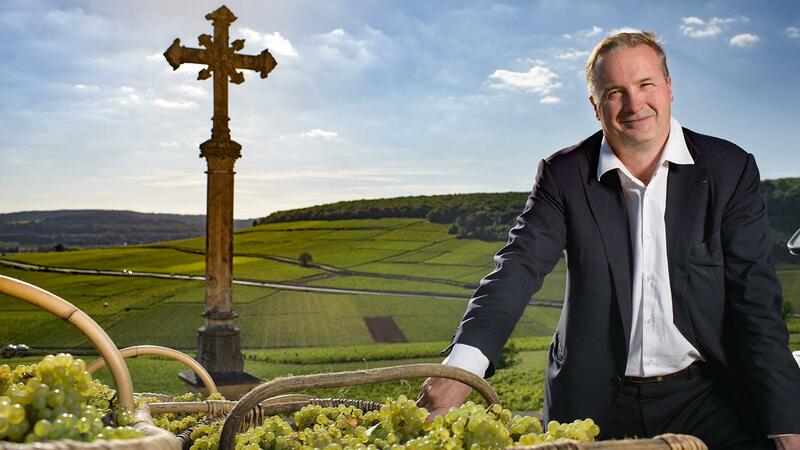 President Louis-Fabrice Latour and enologist Jean-Charles Thomas were waiting with nearly 50 different cuvées from the southern part of Beaujolais to Marsannay at the northern end of the Côte d'Or. Just to set the stage for the tasting, Latour explained that in 2016, frost hit parts of some grands crus, particularly Echézeaux, Chevalier-Montrachet and Montrachet, the western side of the hill of Corton and others more marginally. This is unusual, because frost rarely affects the grands crus vineyards. Yields ranged from 0.9 to 1.1 tons per acre in parcels affected by frost; elsewhere yields were in the normal 2.2 to 4.0 tons per acre range. On average, the vinifications lasted 12 to 15 days, with pigéage (punch-downs) twice a day. It was enough to extract color, flavors and tannins from the skins, according to Thomas. "It was very challenging for the fermentation, aging and bottling, because we were not equipped to handle such low volumes," he added, referring to the cuvées decimated by the frost. There are some excellent wines in the range, though some reds exhibit rustic tannins due to the low yields. Additional aging will help, and though some of the wines at this tasting were bottled, many had just been racked and blended in tank, or still in barrel. Beginning with the Pinot Noirs, the Louis Latour Marsannay 2016, bottled in July 2017, is rich and juicy, sporting black cherry, earth, and mineral flavors. From 12 different growers, it offers a snapshot of the village. I also like the Nuits-St.-Georges, exuding black cherry and blueberry fruit. It's intense, balanced and more open and fluid than many of its peers. The Chambolle-Musigny, farmed and vinified by Latour, offers ripe black currant and violet notes, with succulent texture and balance. Aloxe-Corton Les Chaillots is superconcentrated, displaying black cherry, blackberry and black currant flavors. Damaged by frost and only yielding 1.1 to 1.3 tons per acre, it's chunky, yet not rustic, with firm tannins on the finish. The top-quality premier cru is the Vosne-Romanée Les Beaux Monts, fermented with close to 50 percent whole clusters. Though more reserved, it's saturated with red fruit, cherry, strawberry, floral and spice notes; it's very long if a bit compact on the finish now. At the grand cru level, the flagship Château Corton-Grancey is pure, vibrant, elegant and very focused, featuring cherry, currant, earth and mineral flavors. Powerful and majestic, the Chambertin Cuvée Heritiers Latour delivers black cherry and blackberry fruit, melding into sophistication and grace, its vibrant acidity and well-mannered tannins playing out on the long finish. There's a bigger, beefier Romanée-St.-Vivant Les Quatre Journaux in 2016, with violet, black currant, bilberry and mineral aromas and flavors ending with elegant, refined tannins. The Chardonnays, mostly bottled now, didn't show the same intensity and precision as the Pinot Noirs in general, though may need a little time to pull themselves together. Nonetheless, there is an opulent, yet vibrant Puligny-Montrachet, with peach, lemon and honey notes and fine contrast between the muscular, concentrated Chassagne-Montrachet Cailleret and more nervous, tightly wound Chassagne-Montrachet La Grade Montagne, full of lemon, apple, mineral and stony elements. Latour's Corton-Charlemagne yielded two-thirds of a normal crop; it starts out with lemony austerity, picking up white peach, viscosity and mineral underneath, ending with energy, power and complexity. The Chevalier-Montrachet Les Demoiselles represents half the normal crop, exuding white flowers, white peach and lemon verbena flavors. It's creamy, yet focused, expanding to a long finish.